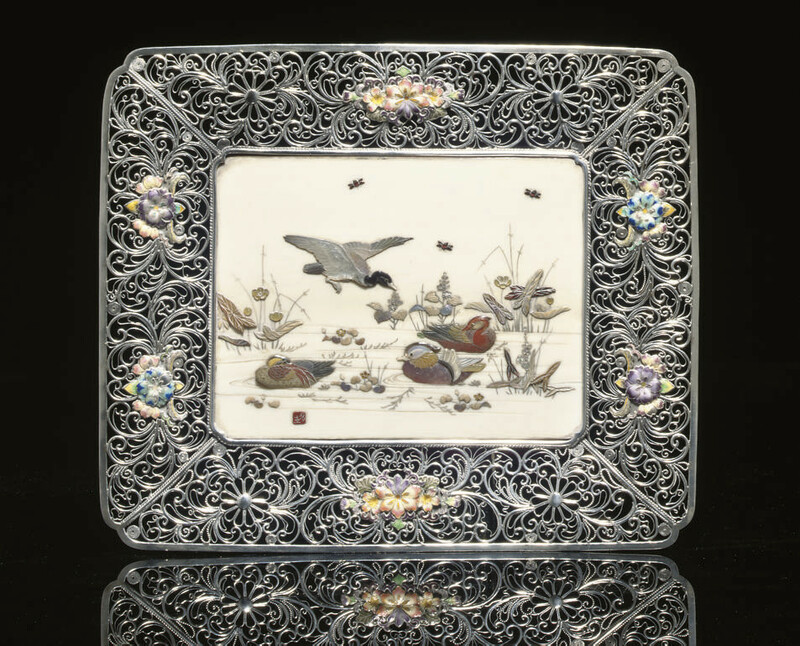 of rectangular form with indented foliate corners, the pierced silver rim with stylised kiku flowerheads amongst scrolling tendrils, interspersed with motifs of colourfully enamelled cherry blossoms, the central panel of ivory inlaid in mother-of-pearl, tortoise shell, and stained ivory with mandrakes and hornbill ducks upon a watery landscape surrounded by flowering lotus branches, small insects flying above their heads, signed on a square red lacquer tablet Yasugi(? ), raised on four silver filigree supports -- 8 7/16in. (21.5cm.) wide.